The Church, the Eucharist and Mary! The history of the Church is replete with Eucharistic Miracles. In the year 595, during the life of Pope Gregory, it was the custom of the faithful to prepare the bread used for the Eucharist. One Sunday, while Pope St. Gregory was celebrating Holy Mass in the ancient church of St. Peter, a woman in line to receive the Eucharist was laughing out loud. The Pope was greatly disturbed and asked her, “Why?” The woman defended herself that she could not come to believe that it was possible for bread made by her own hands to become the Body and Blood of Jesus Christ, thanks to the words of consecration. At that point, he prohibited her from receiving Holy Communion and he implored God to enlighten her. When she saw the very portion of bread prepared by her turn into Flesh and Blood, the woman fell to her knees and repented. Today, part of the Relic is preserved at Andechs in Germany. In the city of Rimini, Italy, it is still possible to visit the church built in honor of a Eucharistic Miracle worked by Saint Anthony of Padua. In 1227, Anthony was conversing with a heretic who was against the Sacrament of the Eucharist. He challenged the Saint to prove to him that the Body and Blood of Christ were truly present in Holy Communion. Anthony suggested that he change the challenge. He offered to withhold food from an animal for three days so that it would feel the torment of hunger. He publicly led the animal out and offered it a hearty bowl of food while placing the monstrance containing the Body and Blood of Christ before it. He asked the heretic, “If the animal passes up the food and adores His God, will you then embrace the Church? The animal passed up the food and fell to its knees bowing to the Eucharist. In Lanciano, Italy, some 700 years ago during Holy Mass at the moment of Consecration, the bread turned into visible human flesh and the wine into human blood. The miracle is validated and continues to this day. All of these are beautiful testimonials to the most basic and exalted truth of the Catholic Church regarding the real presence of Jesus Christ in the Eucharist. The Church has suffered enormously over the past 50 years. The most serious problem facing the Church today, the most important issue which must be addressed more than the scandals that abound, is the loss of belief in the real presence of Christ in the Holy Eucharist. What is amazing is the number of people who do not believe what the Church has always taught about the true presence of Christ in the Eucharist. This is a very serious problem which has to be corrected. The Eucharist is the Source and Summit of the Christian life! In the Blessed Eucharist is contained the whole spiritual good of the Church – Christ Himself: All the Sacraments, liturgy and devotions, the very life of the Church flow from the Eucharist. Statistics in the USA and Europe in 1994 showed that 2 out of 3 Catholics under the age of 45 believe the Eucharist is only a symbolic reminder of Christ. One half of those who attend Mass on Sunday describe the Eucharist as symbolic. This represents 15 million Catholics. A poll taken one year ago indicates that 77% believe one can be a good Catholic without attending Mass on Sunday and 70% of those between the ages of 18-45 believe the Eucharist to be symbolic. This should be no surprise to us. We have had 50 years of catechesis without content, a theology without the Cross and a spirituality without Our Lady! It is diabolical! What is Satan’s plan? Attack the Truth by discrediting the Church as a teaching authority; attack the Eucharist – our source of life and unity, and degrade Mary who leads us to Christ and ultimately crushes the head of the Serpent. WHAT, THEN, IS OUR PLAN? Total Consecration to the IMMACULATE HEART OF MARY! If these three are implemented, we will have holy vocations. We need adoration of the Blessed Eucharist and we must be prepared to defend It against the errors which abound. Jesus is not just in the host or with the host; He is the Host Itself! Each and every particle of the host and every drop of precious Blood contain the whole Christ. Holy Communion preserves us from mortal sin and remits venial sin. It is a remedy through which we are delivered from our daily faults. It is the most powerful remedy against temptation. The Eucharist is the Bond of Charity that unites all Christians as members of One Spiritual Body. If we heard a newsflash that Jesus Christ was coming to earth and would be in our city next week, no sacrifice or effort would deter us from making the journey and suffering the discomfort of the crowds to see Him. The Truth is, He is truly here: HE IS PRESENT BODY, BLOOD, SOUL AND DIVINITY! Too often today, the Mass is stripped of its sacrificial meaning and celebrated as if it were merely a fraternal banquet. As we move from the Old Testament to the New Testament, we find the Old is completed in the New: Promise is turned into Fulfillment, Symbol into Reality! To understand the Eucharist and the Mass, we must understand the Jewish customs and practices. We must look at the Passover. The Jews were in slavery. God sent down a series of plagues to convince the Pharaoh to let His people go. A plague of frogs covered the land, a plague of rats, a plague of locust and, then, came the tenth plaque. The Angel of Death was to kill all the first born sons of the land of both the Jews and the Egyptians. The only way to escape that death was to offer up a sacrificial meal – a male lamb without blemish, having no broken bone, was to be strung up and sacrificed by a knife piercing its heart. The people were then to wash themselves with the blood of the lamb. The blood was sprinkled with a hyssop branch on the doors of their homes. When the Angel of Death came over the land, all those with the blood of the lamb on the door were spared the death of their first born. The Passover bonded the people of God through the blood of a lamb. The feast was celebrated each year, renewing their covenant with God and reminding them how faithful He had been to them. They could trust God Who would always save them. Passover established a Covenant with God; It was a sacred family Bond that had to be renewed. Jesus wanted us to be present at the Last Supper and on Calvary, but this was not possible. So, He made the Sacrifice perpetual. The Sacrifice of Jesus is repeated for all eternity, century after century, year after year, day after day, at the Holy Sacrifice of the Mass. It telescopes itself across time. 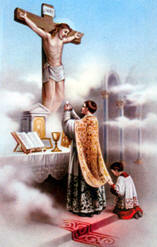 Christ’s once and for all Sacrifice is represented at the Altar in the Mass. The word PRIEST implies SACRIFICE. The Mass is PERPETUAL and ETERNAL. The Mass is the Sacrifice of the New Covenant: Promise to Fulfillment, Symbol to Reality! As often as the Sacrifice of the Cross is celebrated on the Altar, the work of Redemption is carried out. It did not end on the Cross. The work of Redemption continues here and now. It transcends time! The Mass is not a new Sacrifice but a representation. It is the unbloody renewal of the One and Supreme Sacrifice of Christ on Calvary. The Mass is the bloodless Sacrifice, Calvary made present. It spans the Ages. During the Mass, we should place ourselves in the chalice and ciborium. In this way, everything we have: our needs, our sufferings and sacrifices, joys and cares, our entire life will be offered by Jesus to His Father in Heaven for us. This is our priestly sacrifice as a priestly people. In this way, the Mass becomes intimately connected to our everyday life where it reaches its full meaning. Christ is present to us in many ways: present in the community when two or more are gathered in His Name in prayer, He is present in the poor and afflicted, He is present in the heart of a baptized Christian through Faith. But, Christ’s presence in the Eucharist is unique for His Sacred Humanity is present. John’s Gospel was written years after Mathew, Mark and Luke; and when he wrote about the Last Supper, he gave us the theology of it in greater depth. “Unless you eat My Flesh and drink My Blood, you will have no life in you.” History testifies to what the Church has always taught. The doctrine of the true presence is backed by Scriptures and tradition. At the transubstantiation, Christ’s Body, Blood, Soul and Divinity are made present. This remains forever the teaching of the Church. The words the Church uses are most important. Our Faith has a language! For the sacrifice to be real, the Victim must be real. Jesus Christ gave us His sacred humanity so we could become one with God in the fullest sense. We become partakers of His divine nature. We become true sons and daughters of the Living God. The Sacred Species reserved in the Tabernacle is to be adored because Christ is substantially present. The Mystery of the Eucharist in all its fullness is reserved in the Tabernacle to extend to us the Grace of the Sacrifice. The Church and the world have great need for Eucharistic worship. Jesus waits for us in His Sacrament of Love. Let us be generous with our time in going to meet Him in adoration, and in contemplation that is full of faith and ready to make reparation for the great crimes of the world. 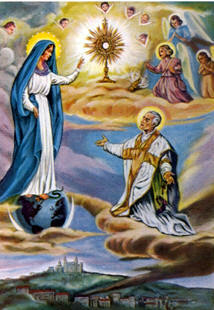 May our adoration never cease! Such visits are a proof of our gratitude and an expression of our love and a concrete acknowledgement of Our Lord’s presence. Every time, we genuflect when we come into the Church or walk past the Tabernacle, or spend time before the Blessed Sacrament, we are making a public profession of Faith. We are saying that we truly believe Jesus Christ is present, Body, Blood, Soul and Divinity in the Holy Eucharist. We must go by Faith not by sight. If only we could grasp the brilliance and luminescence of Christ’s Divinity present in the Blessed Sacrament, we would fall on our knees before our Creator! When will Christ’s light shine through our mediocrity and spiritual blindness? Do we really believe God is present? We spend hours going to a football game or running to the Mall for a sale, but how few people will spend ten minutes before the Blessed Sacrament. Our chapels for adoration should be packed. It is not enough to believe, we must act like we believe. Our chapels are empty and our gestures are meaningless or non-existent. All of this is an external manifestation of our loss of belief in the real presence of Christ in the Eucharist. We have got to get it back in our parishes and we must do it today! We need to restore reverence for the Holy Eucharist. It starts with you and I. We need to set the example. By our genuflections, by our silence in Church, by our visits to Our Eucharistic Lord and, by making frequent holy hours, soon others will be encouraged and follow suit. Our goal has to be holiness and the Mass and the Eucharist are the ultimate foundation of Christian holiness. No matter what other devotions we have, if our presence at Holy Mass is lacking, our spirituality is wanting. Jesus use to retreat to the desert to escape the crowds: now, He is alone again, but for different reasons. He is patiently waiting for us. The Kingdom of Heaven is like a treasure hidden in the field. Christ is really that Treasure! He is the Treasure of all treasures hidden under the appearance of bread and wine but truly present Body and Blood, Soul and Divinity: to console, teach, comfort and heal, and refresh us. He is the Living Bread that has come down from Heaven: Whoever eats His Flesh and drinks His Blood will live forever and have life everlasting. The Holy Eucharist contains the whole spiritual Treasure of the Church that is Christ Himself! It is the Sacrament of Love: It signifies Love and It produces Love! Every wife can be an influence in the life of her husband, every mother an inspiration to her children, every brother and sister a companion and help to their siblings. In the great Charity of Christ, marriage has been elevated to the dignity of a Sacrament! This means that marriage has been taken out of the civil courts and placed in the sanctuary. It means that Our Divine Savior has shed His Precious Blood that your love shall be sanctified, that your children shall know the fear and love of God, and that your union will not fail! Ask an intellectual effort of children who watch television and you will obtain no response. These children have the inability to concentrate and pay attention. They are insecure, superficial and fail to have a solid grasp of intellectual reasoning. Television watchers are filled with the illusion that they have great and vast know-ledge. The young lose their innocence and simplicity. They live in an artificial world of sin, ugliness and stupidity. Irreparable harm is done to their intelligence and hearts. Your efforts and those of their teachers are rendered sterile. Your homes must be sanctuaries where GOD is honored, loved and served, and where parents watch vigilantly over the education of the children. Television is breaking up family life. It prevents conversation of parents and children. Television is the stranger in your home who has been given the place of honor that belongs to God and to you parents. There is no more family life, no more conversation, no more prayer, no more unity! The family is ruptured by the presence of television, which dictates its programs, its opinions and its garbage. GET RID OF IT, TODAY, tonight while the children are sleeping! Educate your children to the full exercise of their spiritual lives. A child’s interior life is the only thing that will arm him against the false maxims of the world. Help put him in touch with truth. Attract him to what is simple, good and beautiful. The home is a church in which dwells the Most Blessed Trinity. Not just anyone should be allowed to come inside. Not just anything may be said, no unfitting or vulgar music may be sung. The home is like a tabernacle, one enters and senses the need for respect; he is taken by a certain feeling of depth, and is sheltered from intellectual and moral degradation. To educate a child is to dare to choose for him the Life of Christ. Sin cannot withstand the presence of a good mother; irresponsibility is rebuked by the industry of a devoted father. Piety, purity, temperance and justice, prudence and courage and all other virtues blossom in the rich soil of a family faithful to God. From such homes, there goes forth a power like the Spirit of God to renew the face of the earth. In the ordinary realm of life, we do not hesitate to choose for our children what is necessary to safeguard their health. In the all-important realm of the child’s soul, we must not hesitate to instruct and demand that which is best for his soul. If our love for our children is true, we will be courageous to take the heroic steps necessary to secure their eternal salvation. Require your children to eat supper together with the family. Let them eat what is served to them. Set a time for studies and supervise their work. Demand of them Christian generosity toward you and their brothers and sisters! Insist upon physical efforts: walking, hiking, biking, tennis, swimming, etc. If they are lax, weak and wanting in energy, it is because they need lots of exercise. Throw out the make-up and nail polish; what is needed is prayer, work and sacrifice. By the Eucharist, you will perform miracles, cure souls, and bring back to the family and to God those who have strayed farthest from home! This entry was posted on Wednesday, March 6th, 2013 at 10:00 pm and is filed under NewsFlash, Saint Philomena. You can follow any responses to this entry through the RSS 2.0 feed. Both comments and pings are currently closed.